On Saturday May 14th, 2011 I was reminded of the no-hitter Dwight Gooden aka Dr K threw 16 years ago while pitching for the NY Yankees. Yes, even as a Yankee I was still keeping tabs on Gooden. Of course me being the Yankees Hater that I am the only Yankees’ games I would watch was when Dwight was pitching. Now in 1996 Dwight was not the same pitcher he was back in the mid 80s, but every once in a while you would see a glimpse of the high rising fastball and the dominate curve ball aka ‘Lord Charles’ (nickname for Gooden’s 12-6 curve ball). On May 14th, 1996 Dwight had it going once again and was on top of the world; it would be one of the last shining individual moments for Dr K. So this past Saturday brought up a lot of great memories for me growing up in mid to late 80s as a Mets fan. 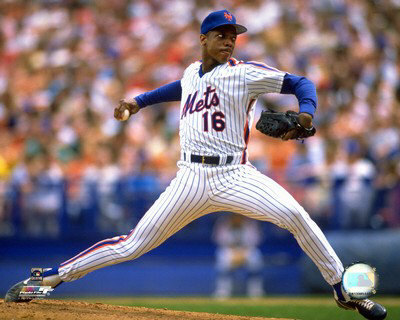 Dwight Gooden will always be 1 of my all-time favorite Mets; even though he has gone through some issues off the field I will always feel a connection to him. Growing up the only time you would catch me in the house was when Gooden was pitching; it didn’t matter if the game was on TV or if I had to listen to the game on the radio (before cable was in my neighborhood). So it was only appropriate that my 1st baseball game took place 2 days after my birthday; the only reason I did not go on my birthday was because my dad wanted to wait until Dwight pitched. It was a great day watching Doc Gooden beat the hated Pittsburgh Pirates and what made the day even more memorable was Dwight (who loved hitting) hit his 1st major league homerun. Of course in my book that was my birthday gift from Gooden, haha!!! But as I mentioned earlier there was the good along with the bad when it comes to Dwight; there are few athletes that affect me outside of sports (Magic Johnson, and Alonzo Mourning). Through the years when I would hear about Gooden getting into trouble it would be a sad moment; in all honesty it was like a family member disappointing me.